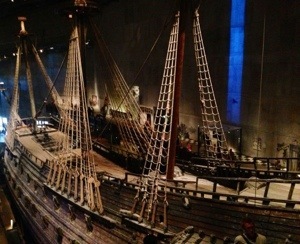 Thank goodness we arrived at the Vasa Museum early, because it was very quickly mobbed by group tours. It was frankly difficult to enjoy the exhibits with all the crush of people. Nevertheless the museum was extraordinary. I was as impressed with the building they built to display the doomed and resurrected ship, as I was with the actual recovery and restoration process. King Gustav II Adolf (1594-1632) built the Vasa (his princely line was called Vasa), named for his heraldic symbol, a vase or a sheaf of wheat. Gustav inherited 3 wars when he sat the throne, and during 18 of his 21 year reign, he was at war. A great and growing country needed the greatest war ship asea, right? 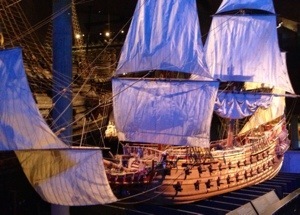 It took nearly 2 years to build Vasa – 1000+ oak trees, masts 50+ meters high, 64 cannon, and thousands of painted and gilded sculptures. 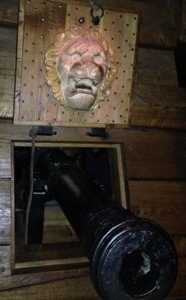 At this time, warfare at sea was dependent on boarding and taking over an enemy’s ship, rather than sinking it with cannon. Vasa was built to change that approach by carrying 150 crew and 300 soldiers – a modern fighting ship carrying the pride and strength of a nation aboard. While it wasn’t the biggest in the world, nor did it have the most cannon, it did have the largest broadside – the combined weight of the shot that could be fired from one side of the ship. 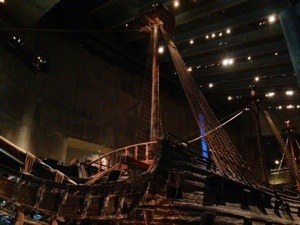 On Sunday, Aug. 10, 1628, Vasa was launched to great ceremony and celebration. 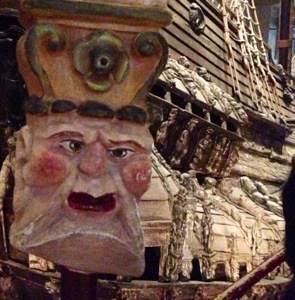 1300 meters after sailing under its own power, Vasa sunk in the mouth of the harbor. When the wind caught the sails, the gun ports flooded with water as the ship heeled, and it went down. Of 150 on board, including women and children (the sailors were allowed to take some family as far as the first islands of the archipelago), the estimate is that 30 people died. When the boat was raised in 1961, the remains of 16 people were found. In my way of thinking, the real story of the ship is its resurrection. That is a fascinating story that includes forensic science trying to construct the dead from the skeletons; art restoration, in trying to figure out what colors were on the sculptures; and the actual raising process, for which many of the tools had to be invented to fit the needs of the salvage operation. 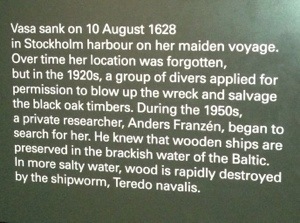 The wreck was found in 1956. Raising began in 1959, and the remains were lifted in 18 stages, to shallow water, where all the parts could be reinforced in preparation for the final lift, in 1961. Conservation and restoration of a ship from the 17th century had never before been attempted, so progress was slow and careful. 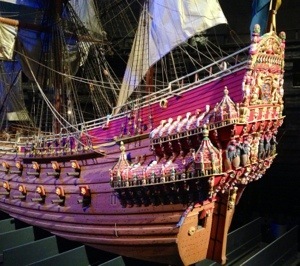 The current Vasa Museum opened in 1990, with the only almost fully intact 17th century ship that has ever been salvaged. The parts of the ship lost to time have been replaced, but the new is quite obvious and distinct from the original. It’s an amazing thing. I think we spent every bit of 4 hours inside, looking at every display and angle of the ship available in the 7 story building (along with thousands of other tourists). 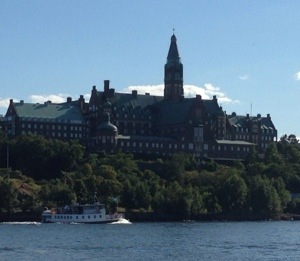 Next, we had the hands-down best meal we’ve had in Stockholm, from the Maharaja Restaurant in the Kungsholmen section (where the finish of the triathlon was set up), on Hantverkargatan. Wow, what a meal! 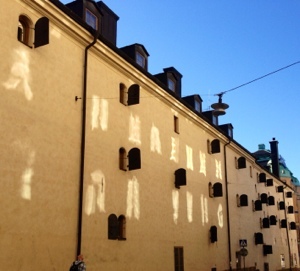 Two tips about Stockholm: eat your main meal at lunch instead of dinner, and you’ll save money; and remember that the word “gatan” means the same as “strassa” in German, and is appended onto the ends of the street names. This is important because on some maps, they leave out the gatan (to save space), and it can get confusing. 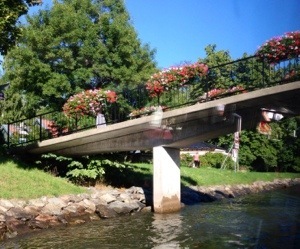 After lunch, we took a canal boat tour and saw much of what we did yesterday, but from the water perspective. 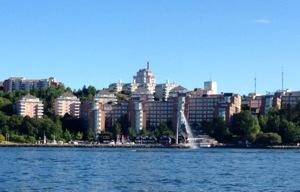 I feel we made the best of our last day in Stockholm. So glad we did both the museum and the boat tour, and that we finished our stay here with a delicious, and reasonably priced meal. Would I come back? I have really loved our time here; but I might choose a different place that costs less to eat in, rather than return here. Still, now we have learned a trick or two that will help with the meal costs, it would be nice to have a longer term to put them to use.